“There are a lot of big corporations like Walmart that are getting solar and battery storage systems, and that’s terrific. There are a few wealthy individuals who are doing it in their homes, and that’s terrific. We want to bend the arc of this technology to benefit those who need it the most – and that includes people in rural areas,” said Todd Olinsky-Paul, Clean Energy Group project director. Called the McKnight Lane Housing Development, the project is likely to save money not only for tenants, but also the local utility and its ratepayers. Each home includes 6-kW rooftop solar panels and a 6 kWh battery system, manufactured by sonnen. 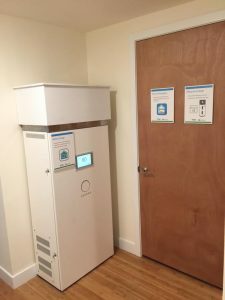 The battery is compact enough to fit in the same closet as the modular home’s water heater. The batteries provide back-up power for tenants during outages. In addition, they serve as a flexible resource for GMP to reduce its grid costs. The utility, which owns the systems, will aggregate the batteries into a virtual power plant and discharge them onto the grid during periods of high demand. GMP’s goal is to lower the transmission and capacity charges it pays to ISO New England. “That can, over the course of number of years, pay down substantially the cost of the batteries,” Olinsky-Paul said in an interview this week. GMP already has experience using microgrids to lower costs. The utility announced this week that it saved $200,000 by using batteries at its Stafford Hill solar microgrid just at the right time. The utility saved $200,000 by using batteries at its Stafford Hill solar microgrid just at the right time. Located in Rutland, Stafford Hill has 2 MW of solar panels and 3.4 MWh of battery storage. The facility’s grid services came into play on August 12 when the temperature hit 90 degrees and electricity use peaked in GMP’s service territory. 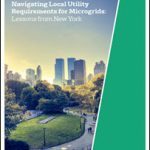 The utility used the microgrid’s solar and battery storage to reduce its demand during the exact hour that New England hit its annual peak. ISO New England charges a utility all year based on how much it contributes to the peak during that one hour. So the utility’s performance is crucial during that period. GMP’s ability to lower demand that one hour led to $200,000 in savings. “Through careful planning, we anticipated when the New England peak load would occur, and worked tirelessly to ensure that control technology would enable us to draw down the power from Stafford Hill providing significant benefit to customers,” said Mary Powell, president and GMP’s CEO. In Addison County, the modular homes not only have microgrids, but also energy efficiency features, making the modular home park a zero energy community. That means the tenants will get a big break on their energy bills. Typically, housing and utilities eat up a big chunk of the income – more than a third – of tenants in the county, according to Elise Shanbacker, executive director of Addison County Community Trust. Renters in the park are now spared from making the choice “between purchasing groceries or paying their fuel bill to stay warm this winter,” she said. The community has emerged from abandonment and dilapidation with all new homes, thanks to the work of several groups and government agencies. Tenants already have moved into several of the homes. Clean Energy Group expects the remainder to be occupied in November. The project, including cleanup of the old site and installation of new homes and the microgrid, cost $3.6 million. Help came from not only the Clean Energy Group and GMP, but also VERMOD, Addison County Community Trust, Cathedral Square, Clean Energy States Alliance, Efficiency Vermont, the High Meadows Fund, the Vermont Community Foundation Sustainable Future Fund, sonnen, Sandia National Laboratories and the US Department of Energy’s Office of Electricity Delivery & Energy Reliability. “At sonnen, our goal is clean, affordable and reliable energy for all. Projects like the McKnight Lane development, enable us to bring new technologies like solar plus storage to lower income communities, providing cost savings and peace of mind for these homeowners, bolstering the local utility grid and contributing to greater clean energy equity,” said Christoph Ostermann, global CEO of sonnen. 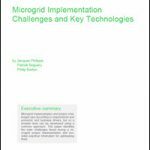 For more articles on the home microgrid, virtual power plants and other distributed energy resources, subscribe to the free Microgrid Knowledge newsletter.